There's more good news on the fight against Ebola in America, ISIS shows another propaganda video with a Western hostage, and a homeless man shows that talent can be found anywhere. Keep calm and carry on: Even though most Americans think there will be another Ebola diagnosis in the coming weeks, the majority are pretty sure the government can prevent a nationwide epidemic, according to the latest CNN/ORC International poll. And while an infected doctor remains hospitalized in New York, a quarantined nurse who said her rights were being violated in New Jersey was released after proving - once again - she didn't have the virus. Propaganda machine: Once again, ISIS is touting a propaganda video featuring a Westerner. 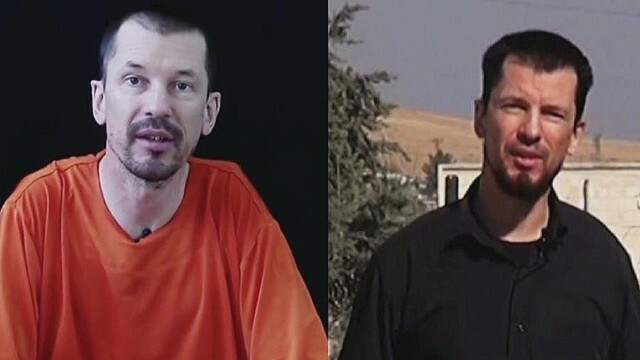 This time, British hostage John Cantlie is shown in the Syrian city of Kobani claiming the border town is mostly controlled by ISIS - contrary to recent Western media reports. Deadly lure: The five victims in last week's shooting at a Washington high school were invited to the same lunch table by the shooter, authorities said. Witnesses also said Jaylen Fryberg, a popular freshman, sent a selfie to his ex-girlfriend showing himself holding a gun not long before the attack that killed two students. Closer and closer: Lava from Kilauea Volcano is now about 70 yards from the closest home and has been moving about five yards per hour. Many residents in Pahoa have fled, spawning another fear - looters rampaging through the village. Blade Runner fights back: South African prosecutors will appeal the verdict and the sentence in the Oscar Pistorius case. A judge sentenced Pistorius to five years in prison last week after finding the double-amputee track star guilty of culpable homicide, or negligent killing, in the shooting death of his girlfriend, Reeva Steenkamp. Firemen rescue snoring horse from pool: Do we really need to say more? Day two and my comments are still awaiting moderation. And I don't see any other comments. I always look forward to this post in the mornings. The videos at the end are always so enjoyable. Good morning CNN team. I'm aware of and understand the comment policy. But I find it rare that no comments were made yesterday other than the ones that I made. And they are still awaiting moderation. I look forward to commenting on New Day topics. I truly enjoyed the homeless man's piano playing as much as the people who stopped and listened. Hey CNN, I am done with this website. You can blame the loss of a reader on the almost full screen ads on the sides of my screen. I can barely touch my damn iPad without being redirected to some BS advertisement. Oh yeah, and if you could relay a message to those advertisers.....I will NEVER buy anything they sell for being so annoying!